gomiki & flygirl, you are too kind. flygirl, I can't wait to see your amazing photos (as usual) when you return from your trip! Ingo, there's always a *next* visit to Dresden! I'm pretty confident you're still be there in 10, 20, or 30 years. It was my pleasure to meet you both! Enjoyed our mini GTG very much. Glad you liked IL TROVATORE. LOL, yes, the communists didn't approve of Royals ... and if you have a closer look at the crown on top of the Royal Box you'll see that it is not a real crown, more sort of a model that you'd use for carnival. 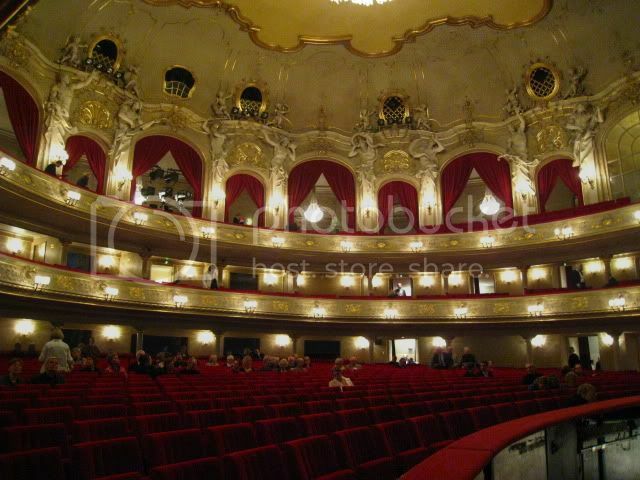 Of course, the opera house was restored after original plans so the communists had no chance to get away w/o Royal Box. Hi Ingo, yes, I saw that article. I just noted such a huge contrast in style between the 2 Vermeers, that they seem impossible to be done by the same person, esp knowing Vermeer's paintings are usually very delicate and exquisite. The Procuress is none of those. I hope it won't take us 30 years before we make our way back to Dresden! I still need to visit Prague, and Leipzig, and Spreewald . . .
We checked out and left our small overnight bag at the luggage room. Ingo had suggested checking out the Neustadt across the river. As it was still too early for museums, we followed (loosely) his recommended route. 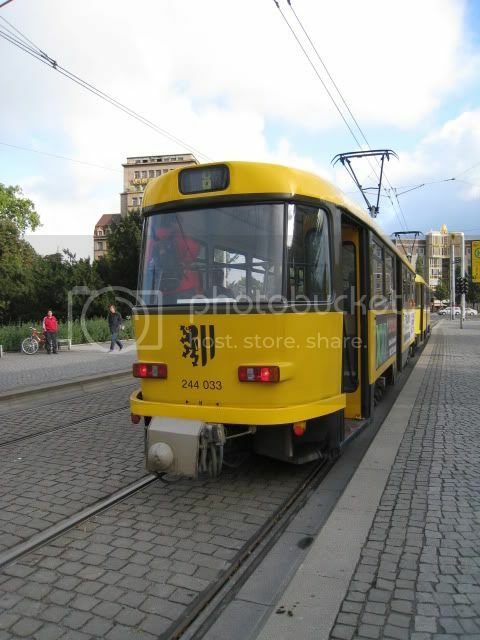 We took the tram across the river and got off at Albertplatz. We walked down Konigstrasse, passing Dreikonigskirche. We didn't go in the church because it looked closed (honestly, we didn't check for sure). Further down the street, we reached the Japanese Palace (now an exhibition space, I think). Finally we made our way to Augustus’ golden statue. 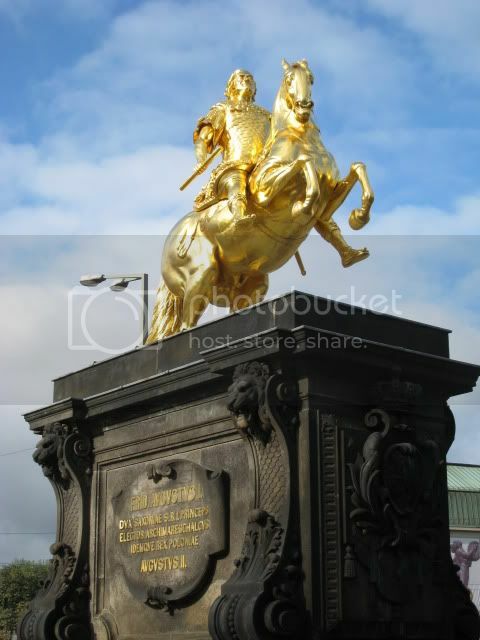 By now, the sun was out and the statue was so shiny I was unable look straight at it! We got nice views of the Old Town as we crossed the river via Augustus Bridge. It's now just past 10am; we headed for New Green Vault within the Residenzschloss complex. It shares the same entrance as the Historic Green Vault. At 10:15am on this day, they were selling 12:30p and beyond timed tickets for Historic Green Vault. I was amazed by how much “stuff” these emperors/electors collected. None of it serves any real purpose except that they look pretty and are impressive. We spent about 75 minutes there, then climbed up the Hausmannsturm tower. It offers a great view of the city and the river; and the best part is that we were the only people up there! We still had 45 minutes to spare before our 12:30pm Historic Green Vault entry, so we walked along Bruhlsche Terrace to the spot where Canaletto had painted his famous painting of Dresden. http://i406.photobucket.com/albums/p...9/IMG_4519.jpg We walked back to Frauenkirch for a few photo shots given that the sun is out, then hurried back to the entrance for Historic Green Vault. At 12:30pm, they are still selling same day entry tickets for the HGV, but only the last timed entry is available. We forgot to put all our stuff in the lockers, so we were sent back by the guard to the locker room. No bags or coats are allowed inside. Of the 8 rooms in the HGV, 5 are original and 3 are rebuilt after being destroyed by the fire-bombing of 1945. Many of the objects on display are similar to those we saw in the New Green Vault, except they are placed on the mirrored walls here instead of in display cases. I must say, I find the first room – the Amber room – the most impressive. The second most impressive is the jewels room. Not only the diamonds and gemstones are dazzling, so is the room and décor. We didn’t listen to every commentary in each room, but still spent about 75 minutes there. It’s now time to catch our train back to Berlin. We picked up our bag from Ibis and went back to the train station. We had some extra time, so we grabbed a quick lunch from Marche inside the station. 2 sandwiches and 1 drink cost €9. Our 3:04pm train got us back to Berlin around 5:30pm. On our way back to the apartment, we stopped at the Asian market on our street to get some veggies and noodles which we would cook later tonight. I think the Komische Oper tends to stage operas in a modern & alternative way. This production opened just 10 days earlier, and from reading reviews, the director got booed at the premiere. The theme of this production is a circus/magic show. The Duke is the magician and Rigoletto is the clown. There is clever use of trap doors, magic boxes on stage. While I don’t necessarily love his idea, I thought it worked relatively well with the storyline, at least better than the “Car Wreck Traviata”. There were a number of things I didn't like, esp the way the ending was stage. DH hated this. He's never seen Rigoletto live before, and he said he much preferred seeing it in a more "traditional" opera production. The cast was not bad. 1) The audience is younger and more “alternative” looking. Dress code is relaxed and almost anything goes. 4) The opera was performed from beginning to end with NO intermission. We cooked dinner in the apartment after we got back (cost: 3 euro). While I'm not an expert on Vermeer, didn't he go through a historical period? I think artists go through different periods. Ingres comes to mind. I didn't realize that he painted a lot of "academic" paintings until I went to the Louvre retrospective a few years ago. In fact, many artists have such variations in styles. Another example -- think of early Jackson Pollock, when he painted in a pseudo-surrealist style. (Did the same apply to Rothko?) Before he achieved immortality with the drip paintings, he was regarded as a merely competent artist. Unless the provenance is fake also, if this isn't a Vermeer, it can't be a van Meegeren. Great report as always, yk! Looking forward to the rest. I just saw your post on Procuress, Ingo. Tried to pull up the Telegraph article, but the link is down right now. I found the introductory paragraph in a Google cache. Interesting that people did think it was a van Meegeren. I'll read the rest later. The provenance is interesting. If people could trace the provenance back to 1700s in the first place, how could they have thought that it was a van Meegeren forgery? Unless they had doubts about the documented provenance also. I'll have to read the Telegraph article when the link is back up. Ok, the Telegraph link is back up. But the painting referred to by the Telegraph is at Courtauld. Are there two versions? If you compare the Telegraph photo with the photo in essentialvermeer, you can see that even after allowing for color variations in reproductions, the two paintings don't seem to be same. Welcome back yk! Enjoying your trip report as usual and looking forward to reading more. The industrial goth Traviata made me laugh! More on the Procuress. There's indeed an interesting story here, but I'm not sure if I really get it. It sounds like Vermeer actually had a Procuress hanging in his home, and the Courtauld version could be the one that actually hung there, but then, maybe not. In any case, it seems like there's no dispute about the authorship of the one in Dresden. Well, there's a difference between The Procuress hanging in Dresden with Vermeer's name on it and The Procuress in The Art Newspaper article above. The one that is the subject of the article is at the Courtauld and is one that was (possibly) owned by Vermeer's mother in law and was also an object Vermeer painted into two of his own works in the background. However, it's my understanding that The Procuress by Baburen is at the MFA in Boston...unless my eyes deceive me! "Provenance/Ownership History: Please note: The history of ownership is not definitive or comprehensive, as it is under constant review and revision by MFA curators and researchers. 1641, Maria Thins (b. ca. 1593 - d. 1680), Delft [see note 1]; by inheritance to her daughter, Catharina Bolnes (b. 1631 - d. 1688) and her husband, Johannes Vermeer (b. 1632 - d. 1675), Delft [see note 2]; possibly by inheritance to their son, Johannes Johannesz. Vermeer (b. ca. 1663 - d. 1713), Delft [see note 3]. Possibly Sir Hans Sloane (b. 1660 - d. 1753), London [see note 4]; possibly by descent within the Sloane family to Lt. Col. Ronald Francis Assheton Sloane-Stanley (b. 1867 - d. 1949), Cowes, Isle of Wight; February 25, 1949, Sloane-Stanley sale, Christie's, London, lot 52 [see note 5], to Colnaghi on behalf of Roderic Thesiger (dealer), Beaconsfield, England; 1950, sold by Thesiger to the MFA for $1960. (Accession Date: June 8, 1950)"
There has been a lot of discussion about Vermeer's Procuress (in Dresden) and whether it is actually his or a forgery. Unfortunately because Vermeer was either not so prolific or so many of his paintings were lost (only 36 known today) there isn't a wealth of work to base studies of his work on to make affirmative judgments. Personally I felt that neither of the works in the National Gallery in London were his...they didn't have the "feel" that the other Vermeers that I've seen do. yk, did you get to the Vermeers in Berlin? Hi amyb, thanks for your information. After all, beauty is in the eye of the beholder. Even though it's a Vermeer doesn't mean that you or I have to like it. I thought you felt the "Wynn Vermeer" wasn't by him either? It'll be fun if they could put get all 3 Procuress to be shown side-by-side in an exhibition! Thanks for everyone else's comments. ann, I'm still waiting for you to finish your two (?) trip reports. No pressure, really. My home internet connection problem seems to have resolved. I'll try to post a few more installments later today. Great report. Berlin is one of my favorite cities in Europe. Next time we will have to do more of the Cold War stuff, if I can get away with it. My wife is a former Party member (CPSU) so sometimes she gets bored with my fascination of her former life. 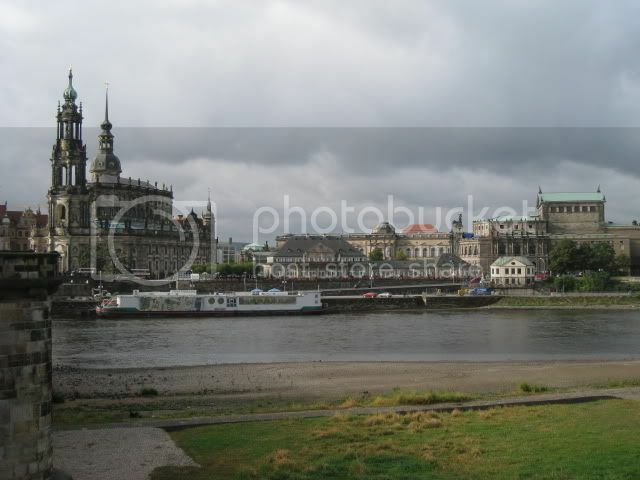 I hope Dresden-lovers won't get offended by what I write next, and please do not take it as a criticism of Dresden. It's simply my point of view. Between our Ibis Hotel and Residenzschloss (~ 1km) is a continuous shopping street flanked by malls on both sides. 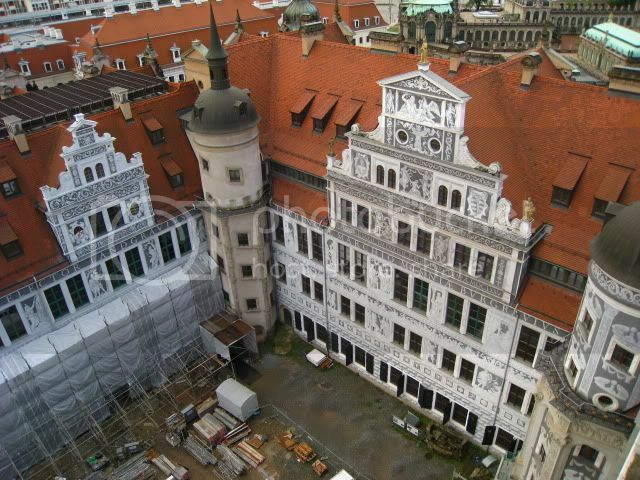 I know that pretty much all of Dresden was destroyed in WWII but I somehow assumed more of old town was rebuilt back to its original baroque architecture. Another thing that threw me off was how black the old buildings are. Initially I thought that was soot and the buildings needed a good wash. Then I learned from Ingo that it is neither dirt nor soot, but simply the way the building material (sandstone) behaves. Brand new sandstone is yellow, but as it gets exposed to air, it gradually turns gray and eventually black over the course of several decades. The grey, rainy weather didn't help either. I tend to love places when it was sunny during my visit. We also encountered a couple of young people in Dresden who don't speak English. This came as a surprise, becuase 1) they are young people; and 2) they work in tourism (that's how we came across them). In Berlin, everyone speaks English. 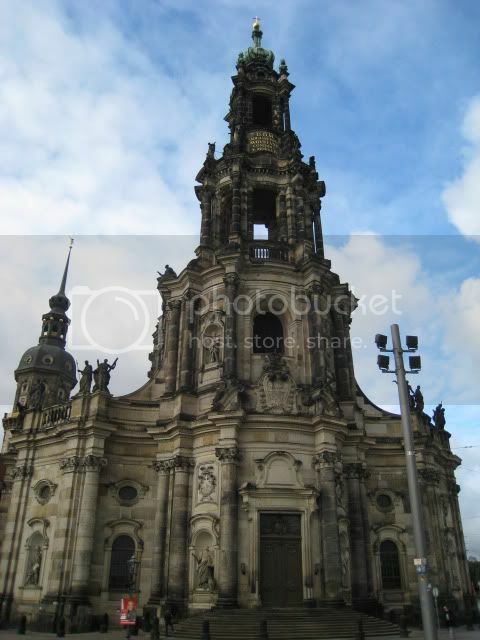 I still enjoyed our stay in Dresden, as it provided a nice retreat/contrast to Berlin. 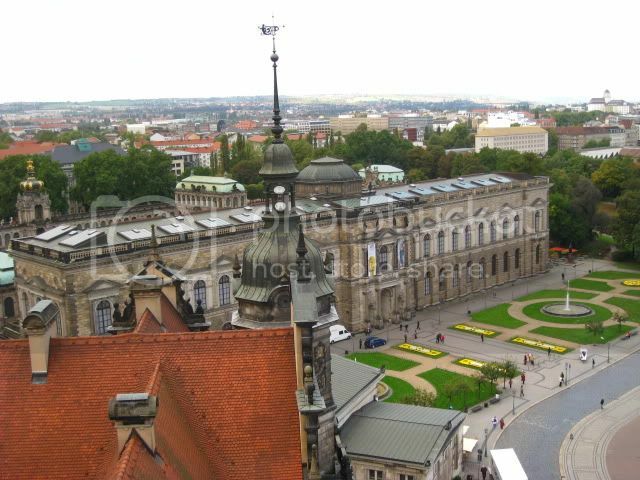 I probably would have liked it more if we had more time in Dresden so that we can actually get to "know" it. Seeing the treasures of the Green Vaults is definitely a memorable experience. I cannot remember the last time I was wow'ed by so many objets d'art for hours on end. 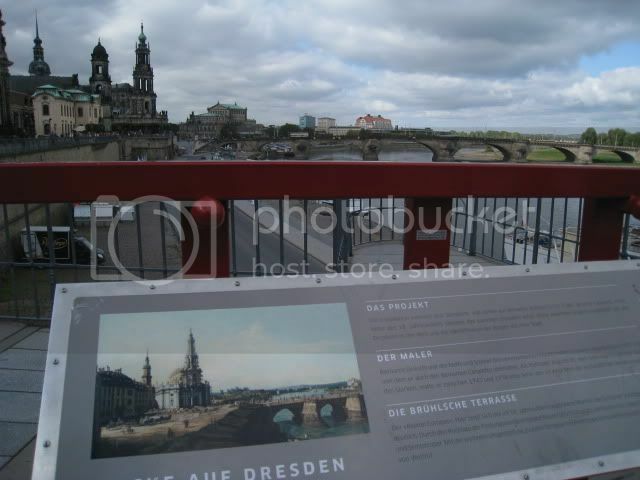 And I know I will revisit Dresden again, hopefully when the rest of the museums are open; and perhaps spend time enjoying the scenic river valley and surrounding areas. Nope, I am not offended. The facts you stated are true and the rest is, of course, subjective. Ok, malls to both sides isn't totally true; there are actually two shopping malls in the city centre, one of them opened a few weeks ago. Maybe you refer to the department stores like Karstadt or Wöhrl or so. The ongoing construction is indeed annoying, but then again, without that we will never fully reconstruct/build the old town, right? You were really unfortunate regarding the weather. Geez. A few days later temps were up in the high 70s and it was sunny. And from noon to early afternoon the next day doesn't leave a lot of time to explore and get know the real city. That's what I tell everyone. The outskirts and old residential areas are the nicest areas IMO. Thanks for your great trip report. I really appreciate how organized you are with all the information! 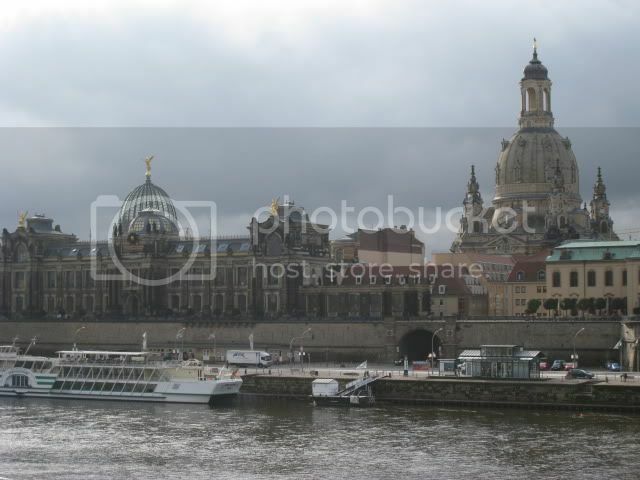 I actually like Dresden -- yes many of the old buildings are black and look "dirty" but it didn't affect the atmosphere of this historic city. It did pour rain for most of the day that I was there, though. That was FUN! 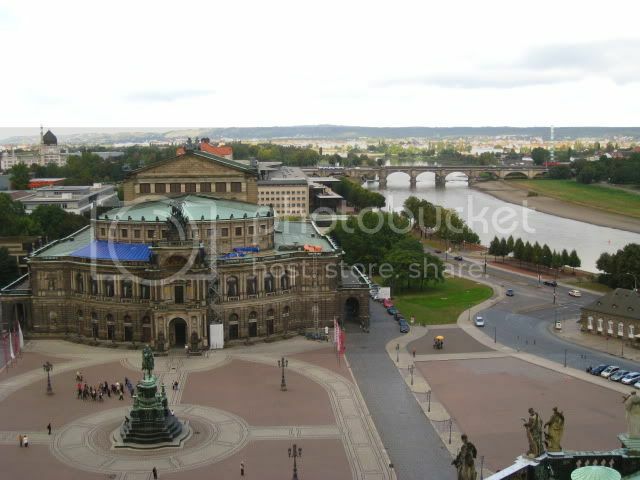 yk, interesting to hear your thoughts on Dresden. I was right in the "old town" (for for almost 48 hours) and the weather was splendid. My experience was rather enjoyable. I understand what Ingo is saying about staying longer and seeing more.... few travelers have that luxury. Ingo, see, it's not all about YOU . I've read many positive posts here on Fodors about Dresden! I attended a Boston Symphony Orchestra concert today. One of the pieces is The Isle of the Dead by Rachmaninoff. I didn't realize Rachmaninoff had lived in Dresden from 1906-1909; and he wrote that piece while in Dresden. According to the program notes, he and his family lived in a "charming Garten-Villa on Sidionienstrasse." I wonder if it is still standing?